Their is no such breed as a "Pit Bull". The term "Pit Bull" is a body description as opposed to an actual dog breed, it's a large umbrella term that covers a wide range of true dog breeds such as; Bulldog breeds, Rhodesian Ridgebacks, Boxers, Bull Terriers, American Pit Bull Terriers, Boston Terriers, American Staffordshire Terriers, American Bully's, Dogo Argentino's, African Boerboel's, Mastiff breeds, and more! All of these dogs are also referred to as "Bully Breeds", but the only breed that has "Pit Bull" actually in it's name is the American Pit Bull Terrier (APBT) really the only "true" Pit Bull. But when Breed Specific Legislation and Breed Bans are put into place they ban "Pit Bulls" which includes all "Bully Breeds". 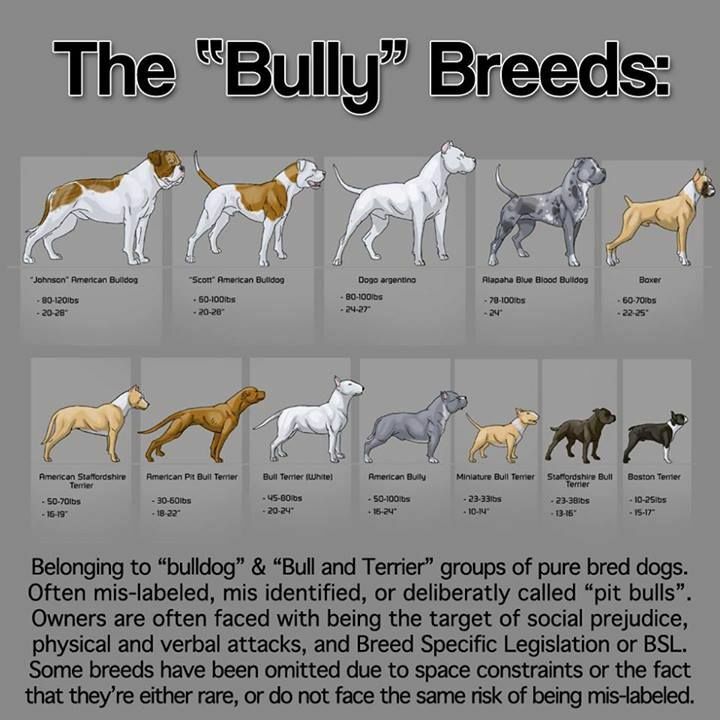 "Bully Breed" Is Not The Same Type of "Bully" As a Children's Playground Bully, "Bully Breed" Does not mean "Mean Dog". History of the American Pit Bull Terrier & Bully Breeds. The generally accepted history of these dogs starts with the Molosser, this now extinct dog was a soldiers' dog used for fighting, hunting, and war. The theory goes that this dog made his way into Britain where he became known as, and evolved into the modern day mastiff and other bully breeds. These early Mastiff-type dogs were used by butchers and came to be called "bullenbeissers," which translates to "bull biter". Ever wonder about the rings in a bull's nose? These dogs were trained to latch onto, "bite" the ring and hold on until the bull was subdued or until the human could remove the cows from the field. These dogs were how humans were able to handle an agitated bull. These dogs were highly prized for their stubborn nature and ability to handle these dangerous bulls. Early depiction of a bulldog. Well as I'm sure you can guess...this practical use of dogs eventually evolved into bull-baiting, and bear fighting which quickly became a form of entertainment in Europe.... And now we have the roots of the modern day "bulldog" and the new term the "pit bull". As humans began to see the cruelty in bull-baiting and bear fighting they began to enact laws that banned such behavior - baiting was made illegal by the British parliament in 1835. Unfortunately the dogs weren't so lucky. The human fighters and remaining fans went underground and began to train/fight their dogs against each other. However - while these dogs were being fought with each other they were selectively bred and trained to be very human friendly so that the human fighters/gamblers could handle their dogs. Through this the dogs gained a reputation for being trustworthy around humans. For the sport of fighting - the slower bulldogs were crossed with the more agile terriers to create a faster super athlete. Terriers themselves were used for both hunting & blood sports - the rat terrier for example was used commonly in a sport called rat-baiting. Working with these dogs people realized they were useful for a wide variety of things and not just fighting. Their bravery and lack of fear was highly prized by hunters - some of these dogs were used to boar hunt, with their tenacity, desire to please, and high working drive they made for great partners when on a hunt. Even today these dogs are still used for boar hunting! Successful hunting dogs were highly prized and cared for by their human counterparts. As immigrants began to cross the ocean they brought along their families and prized possessions which included their dogs. Unfortunately dog fighting also came to America and was common throughout the 19th century. As settlers traveled West these dogs began to change some more. These dogs were used primarily as farm dogs, hunting, and companions/guardians of the families young children. What we know now as the American Pit Bull Terrier (APBT) is a dog that has changed throughout history. Their terrier history gives these dogs a high prey drive and desire to work. Like any hunting breed APBT's generally speaking - have a high prey drive compared to some other dog breeds. This does not mean that they can't be around other animals (Click HERE for more on the subject of prey drive). As the APBT became more popular in the US they were admired for their friendly nature, bravery, and how hardworking they were. They also became mascots for WWI representing bravery and the American Spirit. WWI propaganda poster - notice the kittens in the flag. Over the years the APBT became the All American dog. 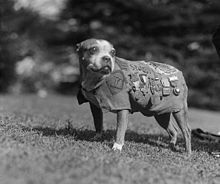 Used in World War I for propoganda posters, they represented the US military and became mascots for the United States Marine Corp. Also in WWI, Sergeant Stubby became the unofficial mascot for the 102nd Infantry Division and was credited with saving the lives of his human comrades. 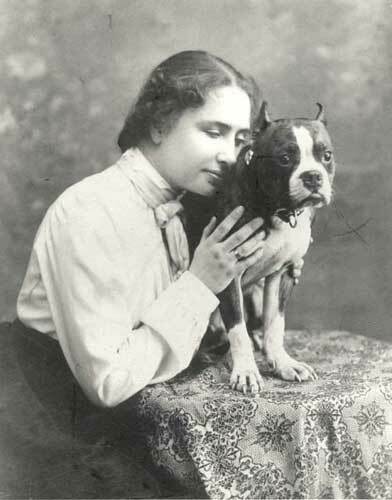 These highly popular breeds were owned by many famous people such as: Helen Keller, Theodore Roosevelt, Woodrow Wilson, Jimmy Carter, Mel Brooks, Fred Astaire, more recently Rachel Ray, Norman Reedus, Danny Trejo, Jennifer Aniston, Kevin Bacon, Josh Hutcherson, Jessica Biel and many more! The APBT has also featured in movies like Buster Brown, and Our Gang. Normally bully breeds are gentle dogs when they are properly cared for, they are social, intelligent, and loyal. They are also athletic, energetic, and agile. The dogs that came to American became known as American Pit Bull Terriers. These dogs are not for every dog owner, and definitely not for first time dog owners. One of the reasons bully breeds end up in shelters & in the news is due to human ignorance. If not given enough exercise they can be very destructive, and tend towards destructive behaviors such as chewing or digging. Bully Breeds Are Powerful Dogs. With Great Power Comes Great Responsibility. Powerful dogs must be respected. They require constant socialization, training, exercise, and they must have a Strong Pack Leader. Many people have multiple bullies in their household, but in order to keep the peace this means that each dog you integrate must be properly socialized, well balanced, and their personalities must match or you'll have a problem on your hands. Two dominant dogs, or a dog with food/toy aggression issues can lead to a dog fight. Now please keep in mind - dog aggression/aggression & dominance are found in all dog breeds, however with powerful breeds it is not something that you can just ignore and hope to resolve itself. Now please don't think that "Strong Pack Leader" means you must "dominance roll", "alpha roll", "submit", or force your dog to do what you want. Many people feel that these dogs must be handled in a very strong manner and they end up being subjected to "prong/pinch", choke, and electric collars. With proper training and breed understanding this is VERY unnecessary. These dogs want to please you. Remember: They were bred for their drive to work. Positive Reinforcement Training works really well with these dogs, and they have been very successful in agility, pulling, obedience, and other fun doggy competitions/sports. What do I mean by Pack Leader? Ziva has a high prey drive....a VERY high prey drive. 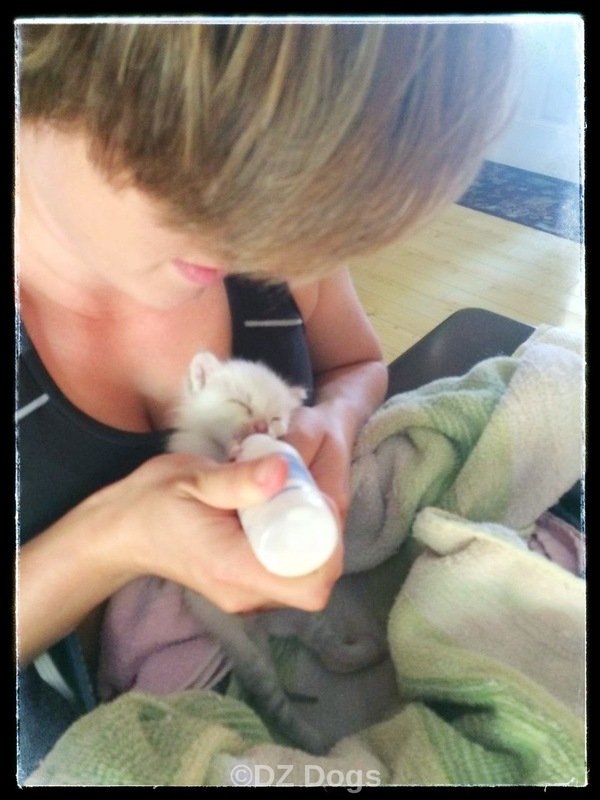 We ended up fostering a kitten for a few months, a little bottle-baby. At first Ziva wanted to eat the kitten, their was a lot of brow furrowing, anxious whining, and very strong eye contact/focus on the kitten. For how we dealt with that issue click HERE. By Pack Leader I mean that your dog trusts, respects you, and looks to you for guidance. This is accomplished through regular training, and exercise with your dog. Dominant dog behavior is not allowed. If you allow your dog to rule the house then again: a bully breed is not the dog for you. With bullies, if you aren't in charge then they feel that they MUST be in charge. This is how you set your bully up for failure and someone can end up getting hurt because your dog views something as a threat where in fact it might not be. Bullies need structure, and leadership as well as love and affection. "While large numbers of pit bull type dogs in this country live out their lives as cherished family companions, many not so fortunate suffer from man-made shortcomings, including unspeakable cruelties, the socio-economic pressures of under-resourced owners, and the relentless biases and discrimination of an ill-informed public. The All American dog began to be exploited through dog fighting in greater numbers in the eighties and were soon associated with poverty, 'urban thugs' and crime....the reputation of the entire breed was dragged down with yet more sensationaliztic headlines and damaging myths and untruths. This set the stage for breed specific laws (BSL)." Unlike many anti "pit bull" advocates want you to believe...the modern bullies of today have generation upon generation roots going back to family and work dogs rather than fighting dogs. On top of that, most shelter bully breeds are mutt mixes rather than true American Pit Bull Terriers. More on BSL and Pit Bull Type Dogs HERE. It only takes a brief look at history to see that these dogs aren't dangerous to humans but the other way around. For hundreds of years these dogs have been family dogs, they have been friendly loving, loyal, and dedicated working dogs. The problem lies with the people who misuse them. With outreach and education, holding owners responsible for the acts of their individual dog we can change the tide of history and restore these unfairly labeled and wonderful dog breeds. Thanks so much for joining the hop and sharing this information. I am taking an online course on Laura Ingalls Wilder (of Little House On The Prairie fame) and supposedly her family had some sort of bulldog on their farm when she was young. I have to admit we did alpha roll with Thunder and Storm and not Freighter. Let's just say, my next Chessie pup will be alpha rolled. When we first adopted Dante we were using the alpha roll on him, so I totally understand the desire to use it with stubborn breeds. It seemed like the only way we could get him to pay attention. But we didn't like having to force him into a submissive position so we began to try different things. The alpha roll then changed into "jedi dog trick" or so my hubby calls it. We use it as a calming position. Basically if the pups are too riled up we say "down" in a very quiet voice and pass hands over them - without touching them, and they flop over without a struggle, usually with a loud huff...and there they must stay until they are sufficiently chilled out. Works great for us! Took some practice though. Happy TT! Great post about the bully breed. Does the French Bulldog fall into line here? The Frenchies came from the English bulldogs - presumably a toy variety of English Bulldog. The English Bulldog was a descendant of the ancient Molossers. So for Frenchies it went - Molosser, bullenbeisser "bull biters", bulldogs, then the bulldog was crossed with terrier to make them smaller and pugs. These crosses were a form of "toy bulldog". As they traveled throughout France they became very famous and popular among the highly fashionable, as the breed developed they became known as : Boule-Dog Fancais or French bulldog! PepiSmartDog: always pleased to see comprehensive information about American Pit Bull Terriers which is written factually and not emotionally. The breed need more posts like yours, rather than so many which are OTT in emotions. Keep the great posts up! Thank you for joining our Thankful Thursday Weekly Blog Hop! We love reading your posts and seeing what you got up to each week. We're not a fan of flipping dogs Cesar Milan style, it can actually cause more frustration, anxiety, and ultimately lead to a bite that would be deserved. Bullies don't need to be treated more severely than other breeds but they do require lots of patience because they are soo stubborn. When we use the term pack leader we aren't using it as a dominance thing. Treat training, positive training are way betters ways to go that help to strengthen your doggy human bond and increase the trust in your relationship. Positive training doesn't mean it's all treats though, when you're being naughty depending on the behavior - you phase it out by ignoring it then they don't get the attention they want, you re-direct it onto a new behavior that is wanted, or we do time outs in our house where rather than flipping the dog you send them to their bed and ask for calm behavior. Then they can't only rejoin the group when they are calm. It teaches your dog self control. I hope you would consider a different style of training, we started off training like you but quickly learned that it is not beneficial for the dog and you have a much better bond & they learn quicker with positive training.